Garden Rooms offer an excellent alternative to Conservatories or Orangeries, giving you more control of light levels and ambient temperatures. Shaded in the summer, warm in the winter. 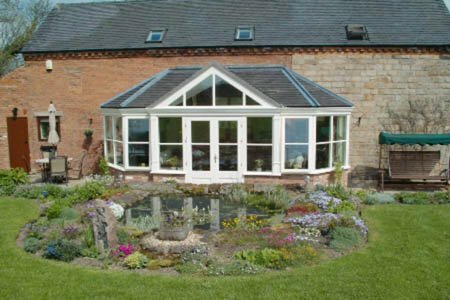 Abbey Glass & Burton Glass can design and build your new Garden Room with your choice of maintenance free PVCu in a range of Woodgrain finishes, or Aluminium and Hardwood in a finish of your choosing. Our Garden Rooms feature solid tiled roofing with the options of suspended or vaulted ceilings and exposed beams. Building Regulations compliant and approved. Planning Permission applied for where required. All our Garden Rooms and individually designed and constructed to compliment both home owners desires and if applicable Planning and conservation area requirements. 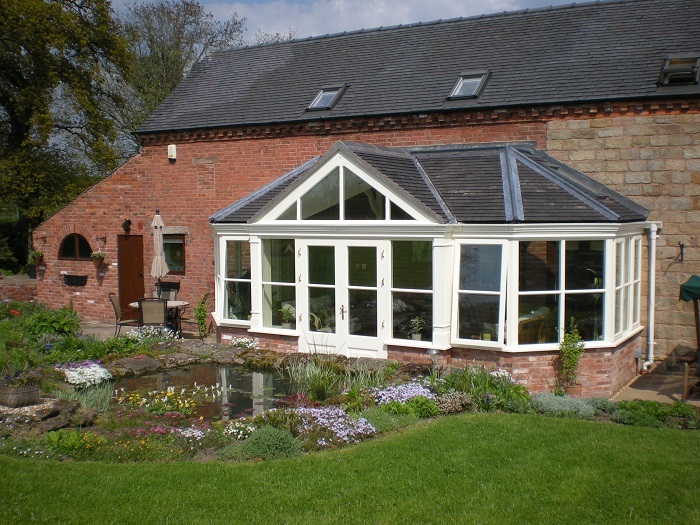 To get an idea of our beautiful work, view our Conservatory Gallery and our Orangeries Gallery today. Garden Rooms offer an excellent alternative to Conservatories or Orangeries, giving you more control of light levels and ambient temperatures. Providing shade in the summer, and staying warm in the winter. One of the amazing aspects from garden rooms is the fact that you can enjoy them all year round. A highly insulated roof means that even in the coldest winter months you can sit in your garden room and enjoy the view without getting cold. Now there is no need to close off a room of your house for half the year just because of the cold! Our garden rooms offer amazing warmth and provide amazing value. I would like to thank you for your professional and friendly service throughout; I am delighted with the finished results. Our window and door frames are glazed with laminated glass as standard. The polythene membrane used in laminated glass acts as a barrier to harmful UV sunrays, which is very important in a Garden Room because these rays can rapidly fade carpets or furnishings. In addition laminated glass gives a much higher level of security than even toughened glass. We offer a full range of Glass & Glazing options including stained glass and bevels all to suit individual requirements and budgets. For more information or for some prices for our Garden Rooms then contact us us direct today. Call us on 01332 371883 or alternatively fill in our online enquiry form.